Famous stamp collectors in history range from King George V to Queen vocalist Freddie Mercury. 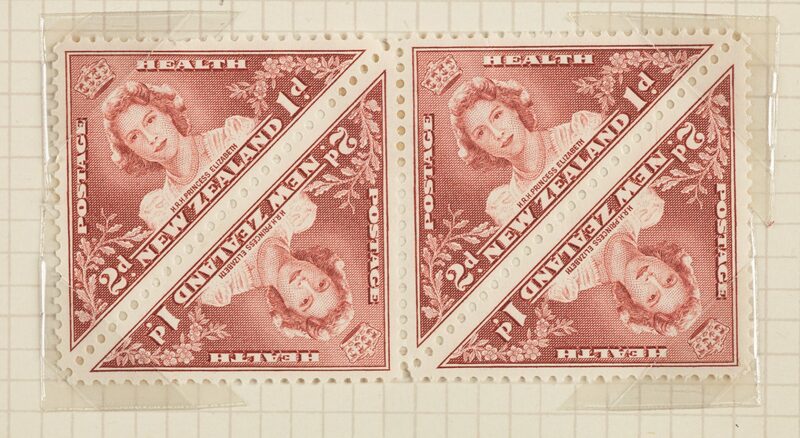 The 1943 New Zealand Health stamps feature prominently in the latter’s carefully arranged schoolboy album. Their triangular shapes carry novelty appeal, while their subject matter is charmingly distinctive: Princess Elizabeth, later Queen Elizabeth II (aged sixteen) and Princess Margaret (aged twelve). 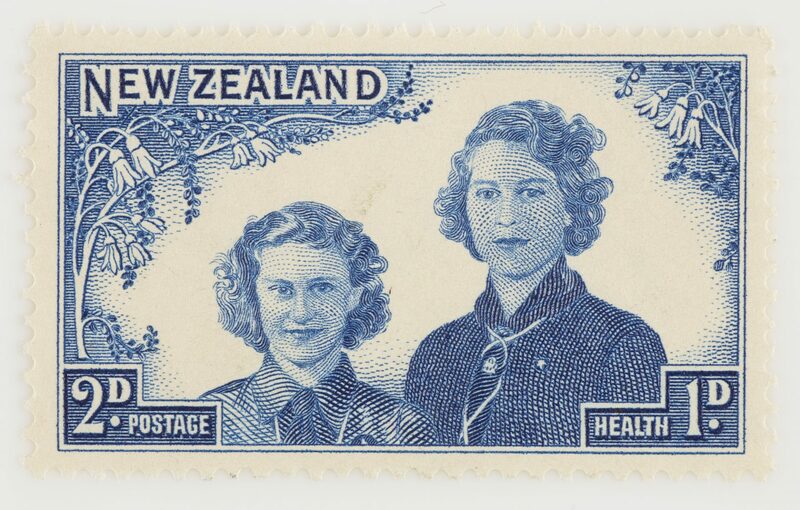 So popular were the royal sisters that they promptly reappeared as Health stamps the following year. In 1946 the two pence Peace Issue stamp portrays the princesses yet again, this time with their parents, King George VI and Queen Elizabeth (later known as the Queen Mother). The inscription solemnly proclaims: ‘In peace long may they reign’. While New Zealand’s monarchical sentiments of the period are obvious, the political and social context of the 1943 Health stamps is less conservative and narrowly Anglocentric than we might assume today. 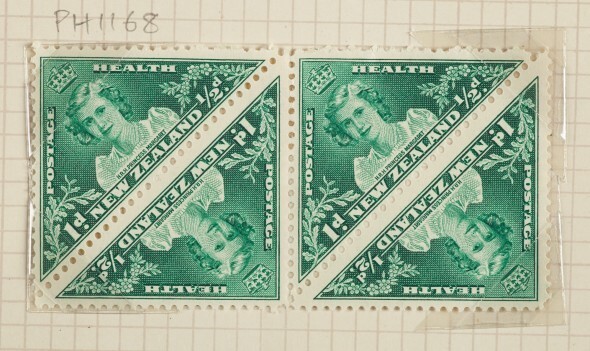 The philatelist (stamp specialist) Robin Gwynn states: ‘If collectors around the world were asked what was distinctive about New Zealand stamps, “health issues” would be one prompt reply’. We were not the first to issue such stamps – credit here goes to Victoria (Australia) and Denmark. But these precedents were essentially pictorial Christmas seals attached to stationery, whereas a particularly ‘Kiwi’ practicality – postage plus a premium that funded a good cause – defined New Zealand’s Health stamps from the outset. 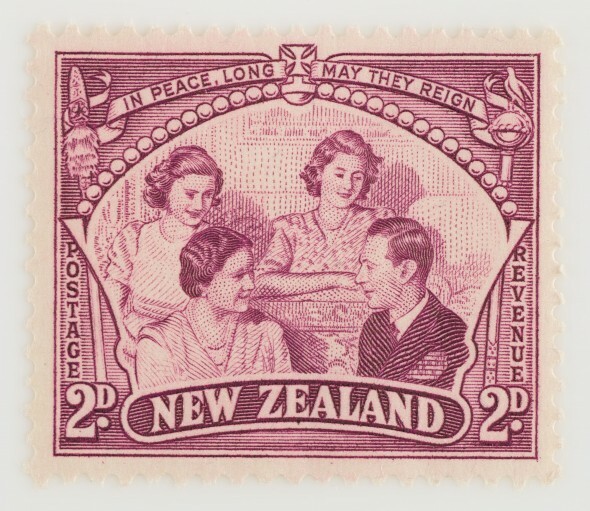 Issued annually since 1929, originally they were marketed and captioned as ‘charity’ stamps. 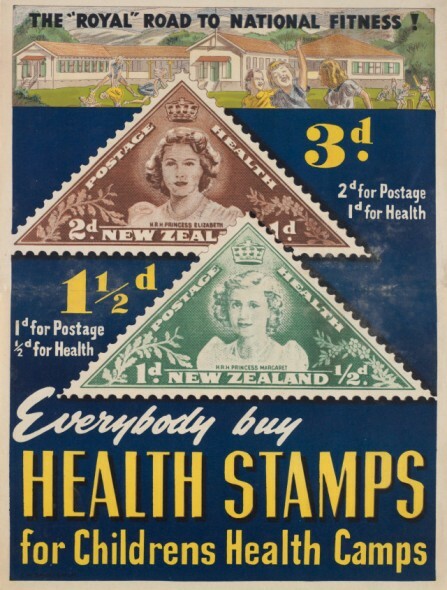 This, however, carried sensitive connotations during the Great Depression, and therefore from 1932 they have always been known as ‘Health’ stamps. Their focus likewise broadened, from specifically funding the anti-tuberculosis campaign to aiding another distinctive New Zealand institution, the children’s health camp movement. During the 1920s and 1930s health camps symbolised the nation’s desire to produce happy, healthy children and citizens of the future. The camps initially reflected worldwide concerns about child health and welfare, but took a remarkable New Zealand turn by the late 1930s, when this country prized itself as a world leading ‘social laboratory’. The national memorial to George V, grandfather of the princesses, was the establishment of a capital fund to develop permanent, year-round health camps and was made possible through government and public contributions. 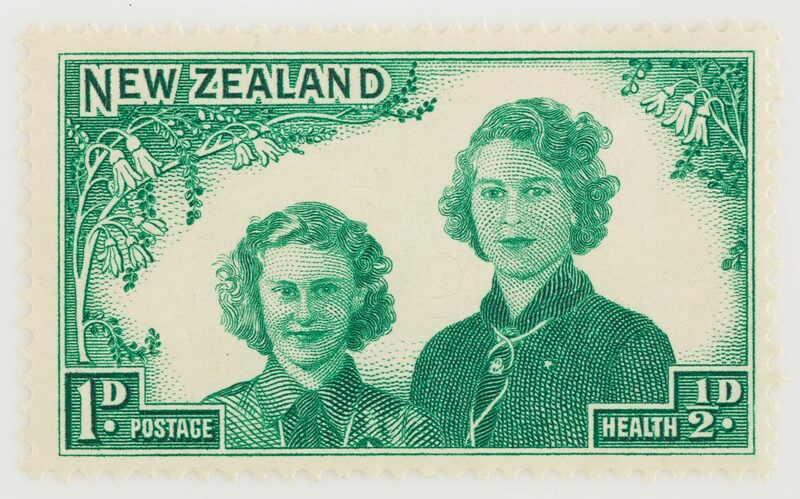 While the running of health camps became increasingly professionalised, the sale of stamps was enthusiastically embraced by the wider community, like Girl Guide biscuits today but on a far greater and sustained scale. 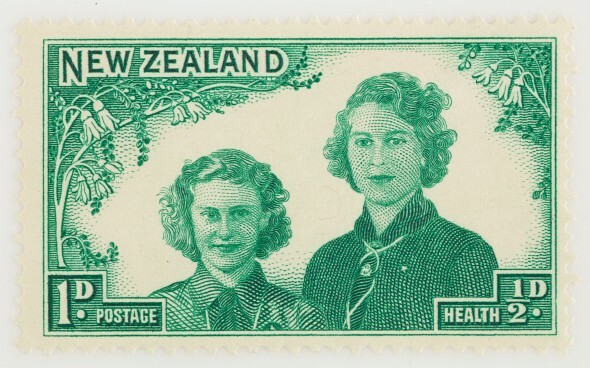 As historian Margaret Tennant claims, ‘happy, smiling New Zealand childhood’ soon came to be associated with the stamps themselves. Accompanying them were first-day covers and promotional posters; several of the latter are Art Deco classics and are highly collectible today. 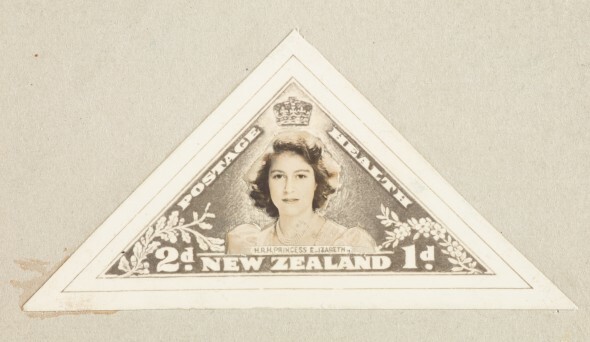 Although triangular stamps of the princesses were proposed in 1940, wartime conditions largely explained their delay till 1943. Announcing them, Health Minister Arnold Nordmeyer anticipated stamps of ‘outstanding design and significance, and for that reason the Royal assent had been sought’. James Berry, who long dominated the field, produced designs that were if not ‘outstanding’ then typically competent. 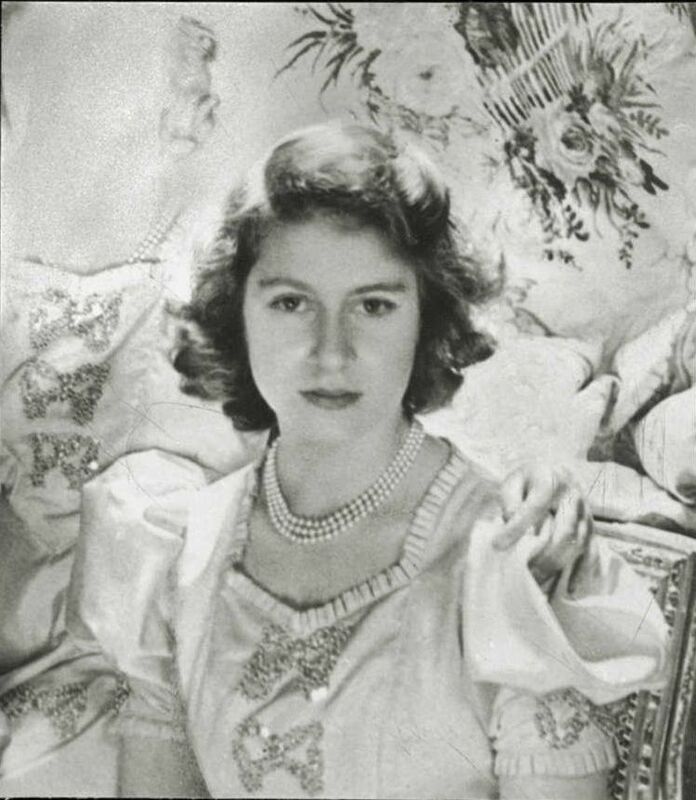 They were based on Cecil Beaton’s official 1942 photographs of the princesses and their mother, evident in the girls’ pearl necklaces and puff-sleeved dresses. While the princesses do not actually smile, they radiate youth, health and positivity. 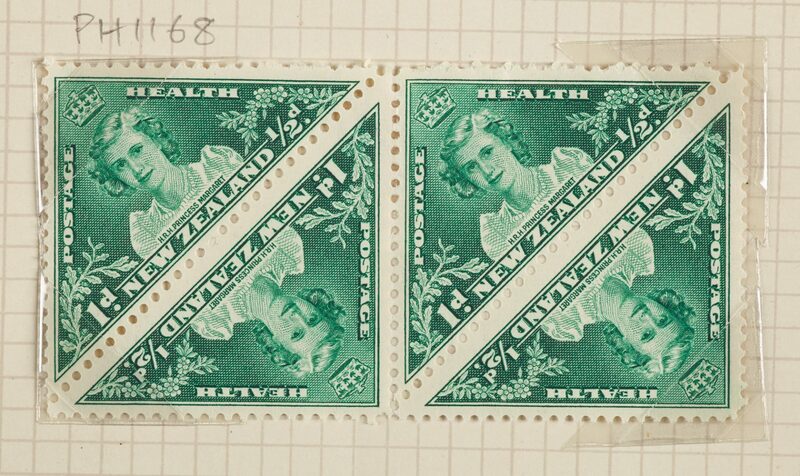 The left hand corner of each stamp features an oak leaf spray, balanced on the right by a manuka spray, whose medicinal properties were long utilised by Māori. As a Girl Guide, Princess Elizabeth had learned about the comparable properties of sphagnum moss. 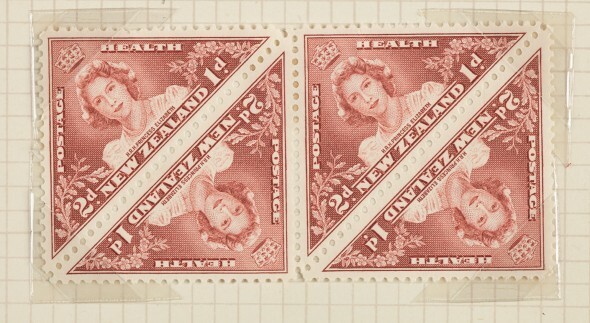 The 1943 Health stamps proved immensely popular. 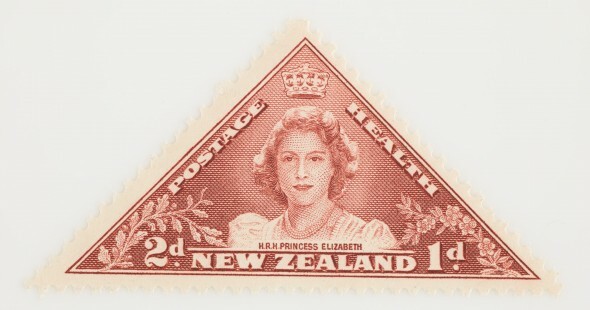 Almost as many were sold on their first day of issue, 1 October 1943, as the entire stock of 1942 Health stamps over a five-month period. 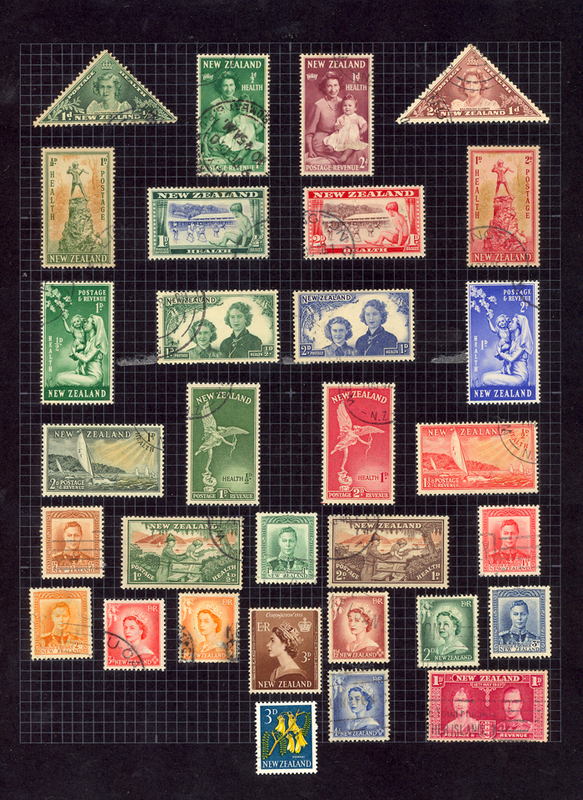 Long queues formed at post offices; the complimentary first day cover was surely an added attraction, as was the way in which each pair of stamps formed a square. 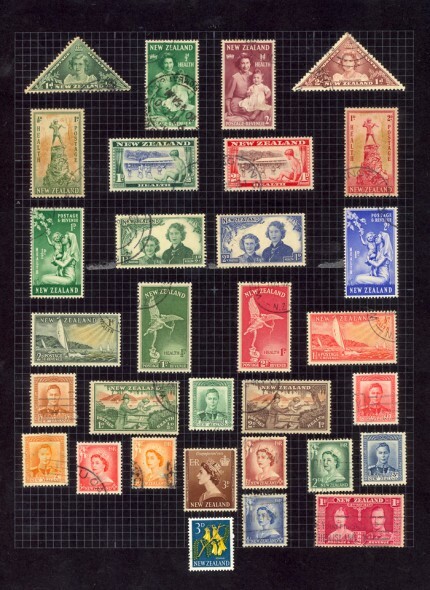 All up, 6,472,797 stamps were sold. 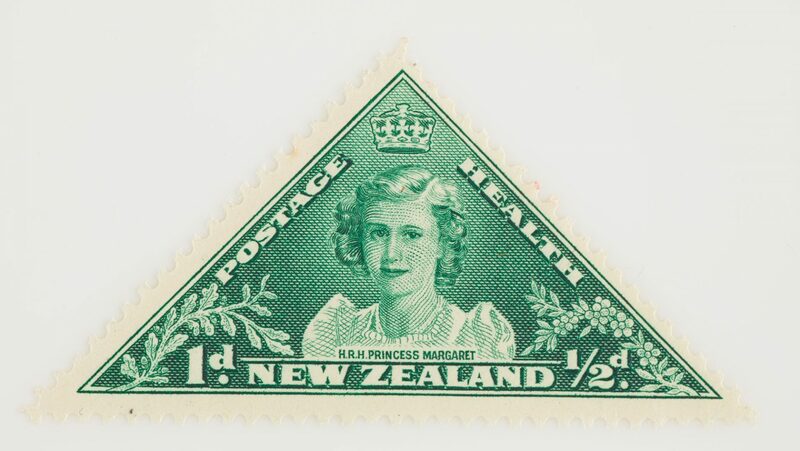 This was a turning point for New Zealand Health stamps, which had previously sold in hundreds of thousands; thereafter, sales were well over six million per issue, exceeding ten million by 1947. This means that a pair of 1943 Health stamps was easily affordable to the young Freddie Mercury and his peers. Capitalising on this success, the more conventional oblong-shaped 1944 Health stamps feature a joint portrait of the princesses. The ‘girly’ pair of 1943 has now been replaced by the more mature, socially responsible Princess Elizabeth in her Sea Rangers uniform, while Princess Margaret wears her Girl Guide equivalent. Acknowledgements are made to the British Postal Museum & Archive, London for providing two essential images for this blog. It is always a delight to read this blog coming from the Long White Cloud. Ty.